You can include optional contact info in your profile box, such as your address, phone number, and email address. This is a great way to let patrons know how to get in contact with you when viewing your guides or profile page in LibGuides. Your physical or mailing address. Your phone number. This will display below your address. Your preferred email address. When you provide an email address, a blue Email Me button will appear under your profile image. Your Skype username. When you provide a username, a blue Skype icon will appear that users can click to start a Skype call with you. The URL to your website or blog. When you provide a URL, a bookmark icon linked to that URL will display under your address and phone number. 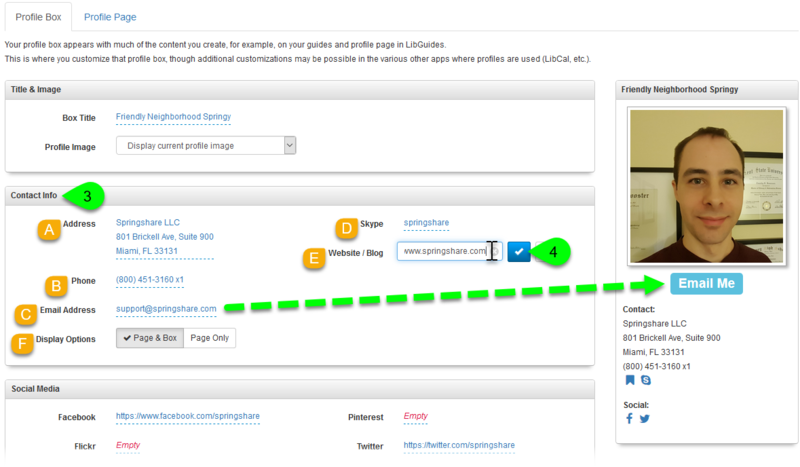 To display your contact info in both your profile box and profile page, click the Page & Box button. Otherwise, click the Page Only button to only display it on your full profile page.